With the assistance of some of the best people in their fields Frank Gehry is creating a series of spaces in the southern French city of Arles, intended to breathe new life into this once-vibrant city. A city knows it has fallen off the grid when the dominant soundtrack to its daily life is the woosh of high-speed trains rattling past at 200 miles per hour. Arles does have a station but the TGVs don't stop here -- they thunder straight past to Marseille. It's a subliminal snub that must have stung for decades, since Arles used to be the site of French railway operator SNCF's main workshops -- it still has a 27-acre industrial 'parc' along the railroad tracks where more than 1,000 'artisans' repaired and restored trains, until it was shut down in the Eighties. Now the derelict buildings and rubble strewn delivery yards are on the brink of a Lazarus-like reincarnation that could see Arles becoming a major landmark on France's cultural map. As with so many ambitious regeneration schemes, there's a big-name architect involved. And they don't come much bigger than Frank Gehry, whose Flamenco-flourish of a Guggenheim art gallery in Bilbao spawned the defining term for culture-led regeneration: the 'Bilbao effect'. Gehry will be designing the landmark building in this project, a rippling tower of stainless steel and stone, with a glass rotunda at its base. It will loom over the main road into town -- the Boulevard Victor Hugo -- as both glittering signpost and gatehouse to the LUMA Arles Arts Campus, welcoming the public into its spacious halls and cafes, and ushering them into the sprawling public park that is planned for the centre of this complex, designed by Belgian landscape architect Bas Smets. Several of the site's crumbling industrial workshops are being transformed by New York architect Annabelle Selldorf into studios and collaborative work spaces, while the cavernous train-length shed, the 'Atelier de la Mécanique', declared itself ready for business with the April launch of a multidisciplinary exhibition of Gehry's own work, under the name Solaris Chronicles. Unlike so many culturally led regeneration initiatives, this is no smug developer's vanity project and neither is it a box-ticking exercise by calculating civil servants for whom a 'starchitect'- designed building is the ultimate cultural commodity. Funded by Swiss-born philanthropist and pharmaceuticals heiress Maja Hoffman, who grew up in Arles, she is determined that a new kind of collaborative creativity will be fostered in this sunny spot, boosting the fortunes not only of her beloved city but also the arts communities she has nurtured for decades. A massively influential supporter of both artists and arts institutions, in France and around the world, she has been evolving the look and feel and facilities for a cutting-edge contemporary campus over the past four years, collaborating closely not just with Gehry (who she signed up in 2008) and Selldorf, but also with a steering committee -- her 'core group' -- comprising some of the most influential and innovative players in the contemporary arts world: conceptual artist Liam Gillick, uber-curator and Serpentine Galleries co-director Hans Ulrich Obrist, video artist Philippe Parreno and Kunsthalle Zurich director Beatrix Ruf. Due for completion in 2018, some €110m are being invested in the built fabric alone. Other partners have joined Hoffman to leverage the cultural and economic capital of this potential arts hotspot. The Ecole National de la Photography -- the first postgraduate college for photography in France, founded in the 1980s -- will move its base here. Actes Sud, a major French publishing house known for its arts, humanities and children's publishing, is also relocating to the site. The regional council of Provence-Alpes-Cotes d'Azur has already renovated the Grande Halle at the far end of the site, and used it as exhibition space for the annual festival of photography, the prestigious Rencentre d'Arles. This year, the festival will also take advantage of the first of Selldorf's renovated spaces, the 1,300 sq m Atelier des Forges, opening this month. 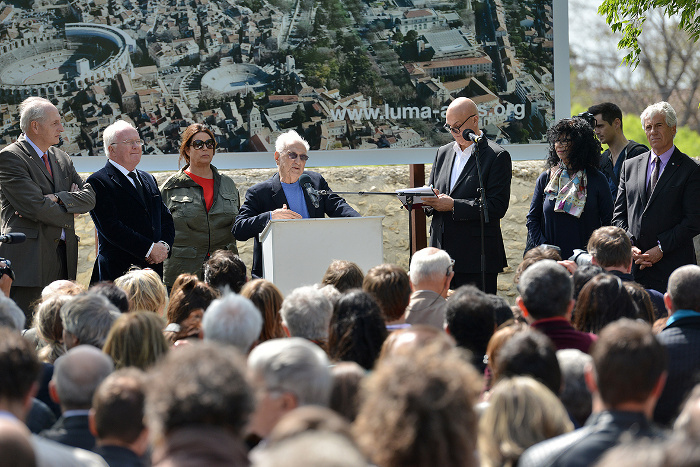 The public launch for the Arles campus attracted a lot of interest. For some, this investment might be seen as the city claiming its rightful place in the cultural firmament. Once the Roman capital in the region, with its remaining ruins earning it UNESCO World Heritage Site protection, the city of Arles and surrounding countryside have served as muse for many significant individuals, including Vincent Van Gogh and his friend Paul Gauguin, inspiring Van Gogh's most prolific period and arguably his most important work, with some 300 paintings completed during the two years that he lived here. 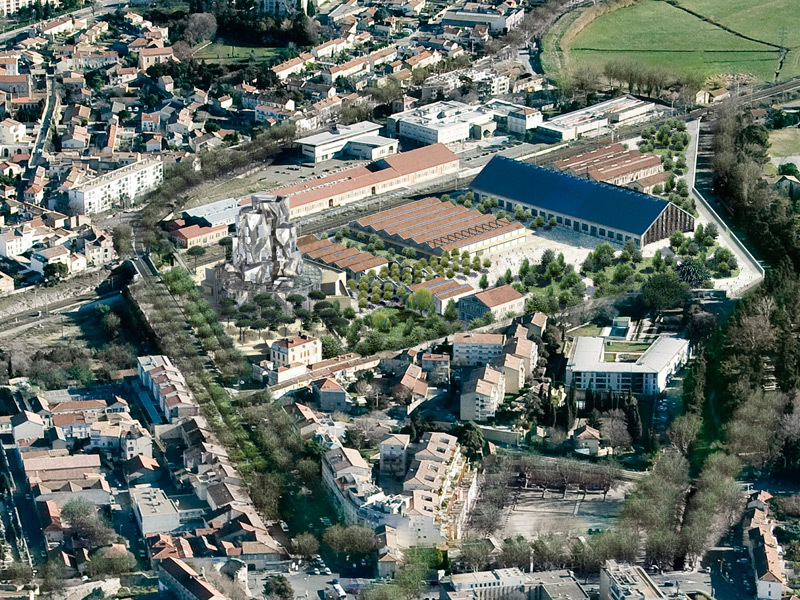 Simultaneously with the launch of the LUMA Arles campus, this April saw the inauguration of the Fondation Vincent Van Gogh's first dedicated exhibition space (designed by FLUOR Architects), hosting not just a permanent collection of Van Gogh's work, but also exhibiting leading contemporary artists whose work resonates with his innovative approach. Solaris Chronicles is designed to 'examine the creative vision of Frank Gehry'. The 7,600 sq m building will house research and reference archive facilities, workshop and seminar rooms, artist studios and galleries. The ground floor atrium space will also host a visitor cafe, while a top-floor restaurant will offer views over the campus as well as the town beyond. The form seems to have been dictated by surrounding rock formations, with shades of Van Gogh's sinewy cypress trees; its contours are clearly designed to capture tessellations of light and shade across the stainless steel external tiles, whose pace and rhythms echo Van Gogh's dynamic -- almost manic -- brushstrokes. From the Boulevard Victor Hugo, the dazzling stainless steel facade dominates. But from the campus, a large stone tower that forms the backbone of the building links this elevation with the stone of the town's historic and Romanesque structures. Intending to 'examine the creative vision of Frank Gehry', Solaris Chronicles is truly an immersive experience of an exhibition. The key exhibits are several large-scale models of Gehry buildings, some built, some unbuilt, placed on huge trestle tables. The setting is starkly chiaroscuro with the buildings placed like islands, dramatically lit from above by graphic neon sculptures and Philippe Parreno's pulsating 'Marquees'. These are clusters of coloured incandescent bulbs that pulsate slowly and sometimes frantically, their rhythms synchronised with a gothic and disjointed organ composition which resembles the sonic noodlings of a psychotic five-year-old. A large and powerful stage light crawls across the ceiling, casting sharp and shifting shadows of these buildings as well as the steel pillars which support this huge former engineering shed. 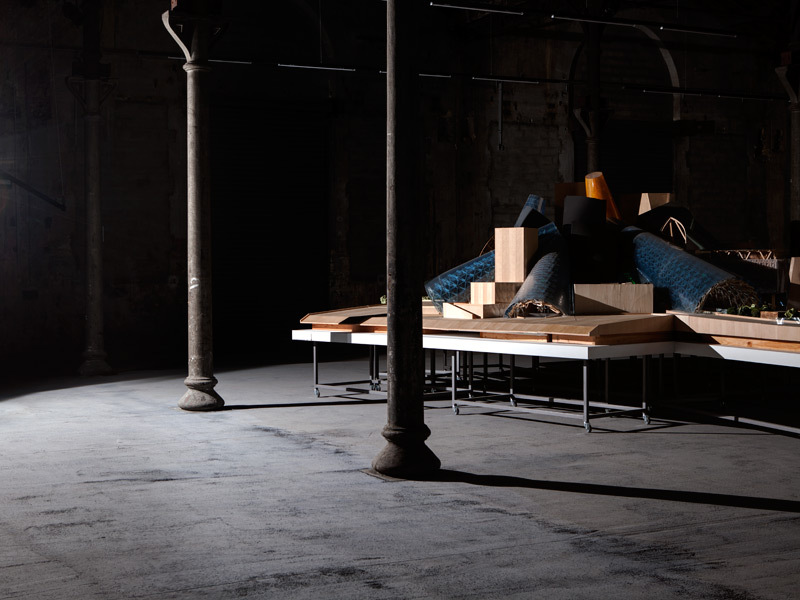 At strategic points we are plunged into darkness, and then exposed to the crashings and scratchings of Pierre Boulez' Rituel in Memoriam Bruno Maderna, while dancers, choreographed by Tino Sehgal, start pushing the trestle tables around the space in a procession both stately and surreal. This image puts what Gehry et al will be creating in Arles in geographical context in the city, illustrating the space the new development will occupy. Programmed in three phases, the choreography starts off slowly: there goes the Guggenheim Bilbao, gently trundling past in a solo excursion. Then several buildings start to waltz around the shed at once, almost colliding in the centre. The pace then picks up with the audience at one point seeming in danger of being mown down by the Guggenheim Abu Dhabi, a colossal structure of toppled blocks and cones, barrelling along the concrete floor. It's wise to get out of the way. For anyone who saw the Hayward Gallery's brilliant exhibition Psycho Buildings, this feels like the action-packed sequel -- in 3D. While the experience is undoubtedly provocative and engaging, I'm not sure how much it enhances or illustrates the Gehry buildings. Gehry himself confessed to shedding 'tears of joy' at seeing his buildings dance around the room. 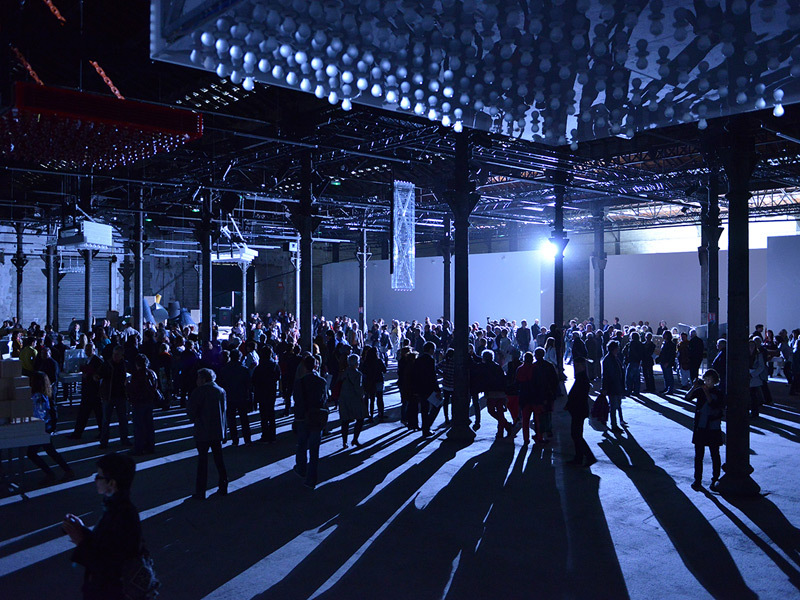 Philippe Parreno says he thinks that adding movement 'makes the buildings seem more human'. They don't seem human. But they are at times eerily beautiful: the Walt Disney Concert Hall comes off the best in the whole grouping, as the most coherent and uplifting of Gehry's sculptural set pieces. The more restrained future projects -- Facebook's campus and the Loyola Law School project -- are surprisingly subdued, not a whisper of whimsy to be found anywhere in their determinedly rectangular structures. 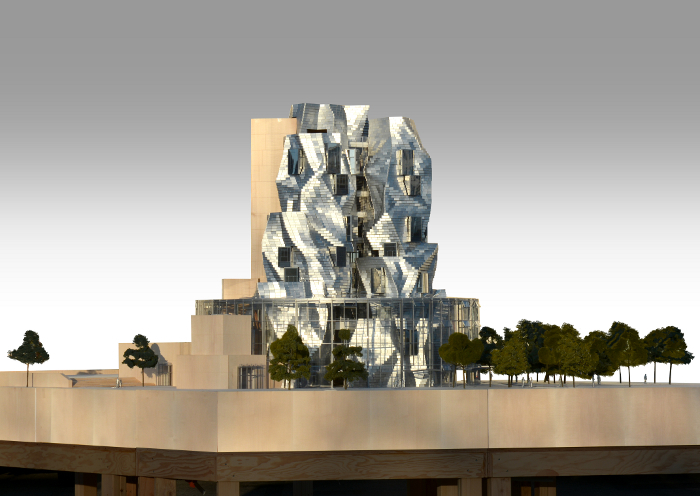 Ultimately, as an insight into Gehry's architecture, it lacks depth. As a multimedia and interactive experience, it has its own unnerving thrills, but no underpinning narrative to haunt you beyond the point when you step back out into the dazzling Arles sunshine.